Since 1996, the DART Light Rail Transit (LRT) system has moved millions of people and sparked billions of dollars in development in the Dallas-Fort Worth economy. 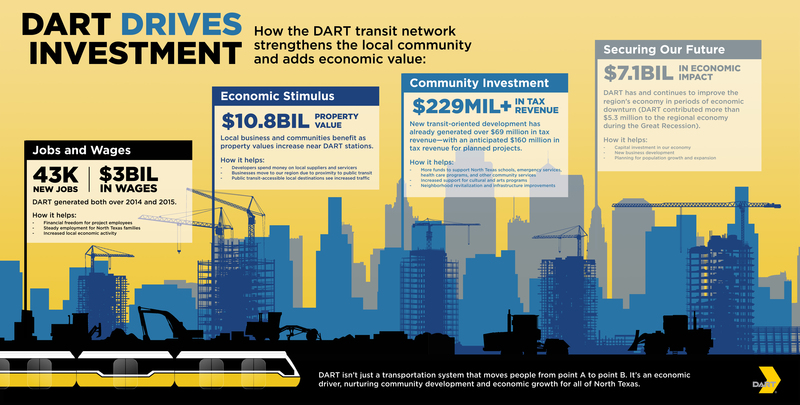 Since 1999, the University of North Texas and DART have partnered to derive the economic impacts of development near light rail stations. As noted numerous times below, property values near DART LRT stations far exceed and grow much faster than those in similar areas without a light rail station. As DART celebrates the 20th anniversary of opening its light rail system in DFW, the Economics Research Group (formerly The Center for Economic Development and Research, CEDR) at the University of North Texas has compiled a review of the six studies done from 1999 to 2013. The purpose of this study is to merge all former UNT-DART studies and derive a comprehensive dollar value of properties near DART LRT stations since inception. In 1999, this office began the collaboration between UNT and DART. This first study concentrated on the change in property values, occupancy and rental rates, and retail sales of properties located near DART LRT stations from 1994 to 1998. The study first compared nearly 700 commercial and residential property values within a quarter-mile 1 of 15 DART LRT stations with 160 properties in eight comparable areas. These comparable areas were deemed similar in both usage and neighborhood characteristics as those properties near DART stations. As seen from Table 1, retail property values increased 12.39% for those near DART stations compared with 7.79% for the comparable areas. Office property values rose substantially around DART stations, almost 29% compared with similar areas, where property values rose only slightly over 6%. Combining all properties studied, those near DART LRT stations on average increased nearly 16% compared with other properties, which rose just under 13%. Despite residential and vacant properties, the results of Table 1 show that proximity to DART LRT stations increased property values at an overall faster clip. The 1999 study also looked at the change in rental and occupancy rates for office buildings, community and neighborhood centers, shopping malls, retail strips, and industrial properties over the same time period. Table 2 shows these changes. Rental rates per square foot for properties analyzed increased at least 20% for 5 out of the eight different property types. Moreover, occupancy rates for the different classes of office buildings were positive over the five-year period. Finally, the 1999 study also looked at changes in gross retail sales in the Dallas Central Business District (CBD). Researchers used four DART LRT stations in the Dallas CBD, West End, Akard, St. Paul and Pearl/Arts District, and observed how retail sales changed since the opening of the DART light rail service. As can be seen from Table 3, gross retail sales increased 36.2% from the year beginning third quarter of 1997 when compared with the year beginning third quarter 1996. The change in gross retail sales for the rest of the city of Dallas was only 3.6% for the same time frame, according to the Texas Comptroller of Public Accounts. In the analysis published in 2002, researchers at UNT again looked to the changes in property values for properties immediately surrounding DART LRT stations. The new study used only properties within a quarter-mile from the stations, and similar to the previous study, a set of control properties to compare against. Unlike the previous study, this study focused on changes in median property values rather than averages. The findings from this analysis confirmed results from the previous study: close proximity to DART stations have a positive impact on property values. Moreover, the authors asserted that “DART rail is an amenity-enhancing service most keenly affecting the market values of properties where people live and where there are comparatively high concentrations of [office] jobs.” The largest changes came from office properties, where those near DART stations saw a 24.7% increase in median property values compared with only an 11.5% increase from the control group. Residential properties also saw a substantial increase: 32.1% for properties within a quarter-mile of DART stations versus a 19.5% increase in the control group. All changes to the different property types can be seen in Table 4. In 2005, almost a decade after the light rail began operating, the same office at UNT presented another study for DART LRT stations, but with a different approach. This study looked at newspaper articles and other community announcements about development within a quarter-mile proximity of DART stations. The announcements were categorized by station and aggregated to a total economic impact on the Dallas-Fort Worth economy (if property values were not announced in the articles, comparable figures were looked up at county appraisal districts). The authors found that new investment with close proximity to DART stations had a total value of $3.3 billion. The stations with the highest values in this report, Park Lane, Las Colinas and Mockingbird, continue to see investment and reinvestment to this day. Table 4A details these top three stations as well as the total impact of development near DART stations. The following research done by this department again looks back at the property values surrounding DART stations since 1999 in tandem with the fiscal impacts of those property values. This report is an update of the previous. Methods used to acquire these property values were similar to the previous report (newspaper announcements for values and locations of development projects), but the authors of this report also utilized work in the field to identify projects not announced in local publications. The study found that values that could be directly attributed to the existence of a nearby DART station totaled $4.26 billion, (values were excluded if the development would have occurred with or without the station, such as with a convenience store) as detailed in Table 5. The results from this 2007 study update those done in the 2005 research. The value of properties near DART stations in the 2005 study ($3.3 billion) increased nearly 50% in the 2007 study ($4.9 billion) due to higher property values and more new development. While some of this increase comes from properties that might have been overlooked in the 2005 study, overall development in the North Texas region increased in this time period as well, with an emphasis on transit-oriented development. The authors gave a favorable outlook for more development around DART stations when ridership and support for expansion were taken into account, and they anticipated that property values would continue to rise. In 2009, DART was on the brink of finishing major extensions and opening new lines for the light rail system. The next study conducted by CEDR for DART looked at the capital projects in line with the completion of these DART lines as well as the projected impacts of operating expenditures for fiscal years 2009 and 2014. In Table 6, the total impact of buildout of the Green Line and Orange Line, and extensions of the Blue Line are outlined. According to this report, expenditures for these lines totaled $2.3 billion, which, when run through the economic input-output model, had a total economic impact of $4.06 billion on the local economy. Additionally, these expenditures caused labor income in the area to increase by $1.5 billion and the creation of over 32,000 jobs. Almost $100 million in taxes were also generated from the spending on the completion of these DART light rail lines. Moreover, this study aimed to estimate the operations spending in 2009 and 2014. DART operations spending supports other spending throughout the local economy despite DART's being a public entity. The spending helps to create direct impacts for local business and employees, as well as creating new jobs and subsequently, tax revenues. According to this 2009 report, DART spent $411 million (Table 7) on operations, which include wages and salaries, goods, and services to support DART on a day-to-day basis. The operations spending, in turn, created a total economic impact of nearly $544 million, almost 5,000 jobs and taxes above $11 million. The paper also estimated what spending on operations might look like in 2014. This produced $501 million of direct spending causing a total economic impact of $663 million, over 5,300 jobs and taxes greater than $13 million (Table 7). In the most recent study done by this office, property values surrounding DART stations were again compared against a set of control property values in similar locations. Like previous studies, the properties within close proximity to DART stations must have been within a quarter-mile radius of the station – a distance researchers agree yields a positive association with increased development. 2 3 4 On top of this support for the quarter-mile distance, the authors conducted further analysis to verify its validity. The analysis done in this study finds that, from 1996 to 2013, new development occurring within three years of the opening of a DART station (and still existing) had a value of $1.5 billion compared with $601 million for the control properties (Table 8). Similarly, the tax revenue generated from the DART station properties outpaced control properties by $22 million ($36 million for DART versus $14 million for control). The 2013 analysis then looked to announced values of upcoming planned and proposed development projects. As seen from Table 5 (page 7), the 2007 study found $4.9 billion in existing and planned development. When this 2013 study was conducted, the authors found, as expected, that some properties slated for future development in the 2007 study were either paused or did not come to fruition, most likely because of the recession. In this analysis, when the properties were updated, planned and proposed developments near DART stations had a total value of $3.8 billion. This summed together with the $1.5 billion of existing property values above makes total property values since 1996 worth $5.3 billion. In the second section of the 2013 study, the authors looked at the effect of different office classes, ages of the structures, and whether the properties were within a quarter-mile or between a quarter-mile and a half-mile all on office lease rates. Regression analysis was used to estimate the effect of these variables. The most notable finding of this analysis shows that properties located within a quarter-mile of a DART station gained a $2.61 statistically significant 5 premium while controlling for office class and age of the building (Table 9). Furthermore, properties outside the quarter-mile radius did not attain the statistical significance nor the positive premium. This aligns with what has been studied in the literature and with the results of past studies done by this office. 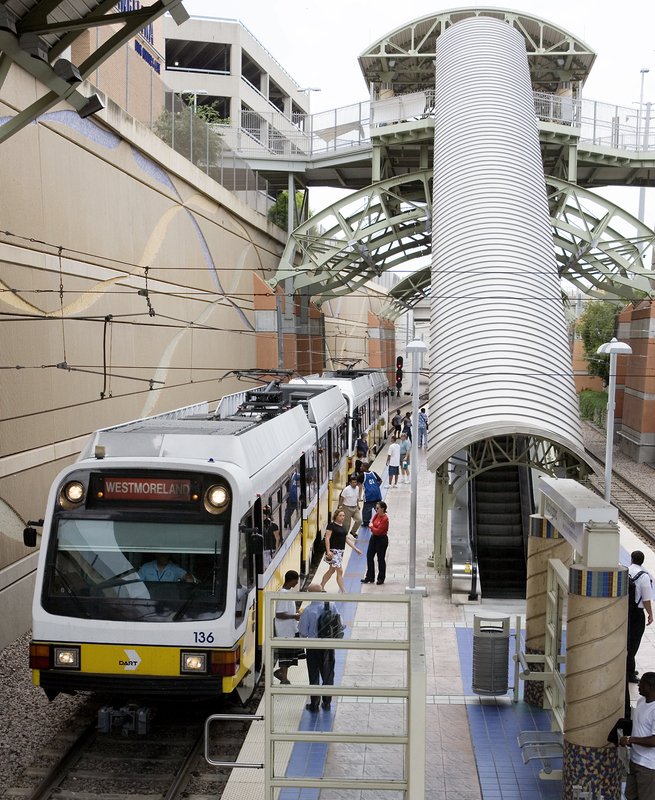 UNT has conducted six economic impact studies of DART LRT stations from 1999 to 2013. These impact studies range from the change in rental rates over time to the aggregated value of properties surrounding DART LRT stations. Though different in methodologies, the studies done over the past 16 years document the positive effects property values derive from being located near a light rail station. Additionally, some studies highlight the substantial economic, fiscal and developmental impacts that result from capital and operational spending by DART. In total, the value of properties within a quarter-mile of DART LRT stations was $5.3 billion as of 2013. What follows this summary of previous findings is the Economic Research Group's newest study of developmental impacts of properties near DART stations for 2014 and 2015. This memorandum details the economic impact of public projects within a quarter-mile of DART stations. The projects were not included in previous University of North Texas projects as the amounts were previously not available. The analysis in the memorandum covers projects that were developed from DART’s early construction and therefore includes more projects completed in 2014-2015. This report excludes downtown stations because of their closeness to one another and the resulting overlap in the quarter-mile criteria. To understand how money being spent developing properties within a quarter-mile of a DART station ripples through a regional economy, the first step is to define the region in question. This study uses the Dallas-Fort Worth region for analysis as its economy is strongly integrated. The U.S. Office of Management and Budget’s (OMB) definition of the “Dallas-Fort Worth-Arlington Metropolitan Statistical Area” is used and the counties included are Collin, Dallas, Denton, Ellis, Hood, Hunt, Johnson, Kaufman, Parker, Rockwall, Somervell, Tarrant and Wise. Next, the values of the selected properties are placed into an Input/Output economic model that examines how the money being spent on property development ripples through a regional economy. Input/Output methodology allows for insight into forward and backward linkages that are present in any regional economy, highlighting how they add value to the initial dollar spent. The model – in this case facilitated by the IMPLAN software package – measures the total annual economic activity that results from inter- and intra-industry transactions. IMPLAN is an industry standard Input/Output tool used to calculate the direct, indirect and induced impacts of spending and employment. The model first breaks the economy into 536 separate sectors, with each sector representing an individual industry, and then it uses a sectoring scheme developed by the IMPLAN Group. This scheme is closely related to the Bureau of Economic Analysis (BEA) REIS model and is a 536 X 536 (row x column) matrix showing all the economic activity among the individual sectors. The entries in the matrix are based on the dollar amount that each industry sells to (and purchases from) other industries in a regional economy. It measures the amount of final consumption by the residents of the region as well as how much each industry exports from the area. The model uses data collected at the county level, which are obtained from the IMPLAN Group and the BEA. County data are in turn aggregated or “rolledup” to form service areas such as local regions, states or larger geographic regions, such as the Southwest. Input/Output models are able to estimate economic impacts because the flow of goods and services within an economic region is relatively stable. Predictions can be made of an industry’s total economic impact by examining the purchasing patterns of the individual sectors. The BEA collects extensive data on these regional trade flows and reports its findings annually. After the region is selected and the data on spending are entered, how the spending flows through the region and impacts it can be calculated. The three levels of spending impacts analyzed are direct, indirect and induced. The direct impact includes the purchases of resources (labor, goods and services) by real estate developers, builders and construction companies for the completion of a project. The indirect impact occurs through industry-to-industry purchases made by regional suppliers. Finally, the induced impact reflects the change in household demand as the employees of real estate developers, builders and construction companies and the employees of their suppliers earn dollars for consumer spending. Therefore, the total impact to the economy is the summation of the direct, indirect and induced components. The indirect and induced portions are commonly known as the multipliers and their impacts often referred to as the “multiplier effect.” It shows how the initial (direct) spending get multiplied through the economy. Calculating the multipliers based on the supplier relationships and employee consumption patterns is much more accurate than simple multiplier tables. The effects that the three levels of impacts and related spending have on employment is also calculated in the IMPLAN economic model. Employment is the total number of full-time wage and salary employees, plus the number of self-employed workers in a particular industry. Part-time workers’ hours are aggregated into full-time equivalents (2,080 hours), and reported with the full-time workers. An IMPLAN economic model will draw from multiple sources of data to offer employment estimates. This is due to the differences in how employment data is gathered by varying government agencies. In general, because of nondisclosure rules, the employment figure reported by government agencies often underestimates true employment in a given county. In accordance with U.S. Code Title 13, Section 9, no datum is published that would disclose the operations of an individual employer or put an individual employer at an unfair disadvantage. By carefully combining employment figures reported by the U.S. Department of Labor, Bureau of Economic Analysis, U.S. Census Bureau and Internal Revenue Service, a fairly comprehensive employment figure can be reconstructed. The raw data are then “sectored” into the appropriate North American Industry Classification System (NAICS) and, in turn, combined into the necessary industry vectors and IMPLAN matrices. The result of this process is a “total employment” impact figure that is a result of the three levels of economic impacts associated with the initial spending. An IMPLAN economic model also calculates employee compensation, which includes all salaries, wages and benefits paid to the industry’s employees resulting from the direct, indirect and induced employment impacts. The figure includes the proprietors’ income of selfemployed people in the industry. The figures reported are gross amounts and taken from the IMPLAN data set. Input/Output methodology and IMPLAN software allow one to leverage and integrate the enormous amount of data collected by government agencies. As such, a reliable model of how spending affects a regional economy can be developed. These models take into account not only how money is initially spent in the “direct” stage of an event, but also inter- and intra-industry transactions. These transactions establish forward and backward linkages in a regional economy during the “indirect” and “induced” stages. In addition to spending, these models also estimate the resulting change in employment. The end product is a comprehensive economic analysis of a given event and its effect on a region. The following section reports the economic impact of public projects within a quarter-mile of DART Light Rail stations. The table below details the direct, indirect, induced and total effects on employment, labor income, value added and output as a result of the development projects. These effects show the dollar amount of the output and employment impacts for development spending in the DFW area. Spending on public projects includes properties built for health care, city halls, school campuses and other public use properties. To correctly analyze the development spending impact, properties were held to a strict quarter-mile radius around DART stations. The dollar amounts and announcements were derived using information from The Dallas Morning News, Dallas Business Journal and other local sources. The property values have been cross-checked with the Dallas and Collin county central appraisal districts and verified using a third-party firm (Cushman & Wakefield). A list of the properties used follows (Table 1). After making the appropriate adjustments, public property spending amounted to $1,815,333,100. This direct impact generated an additional $682,884,872 of indirect activity as contractors and construction firms purchased raw materials. Finally, the induced impacts amounted to $858,142,497, which represents the spending of wages by employees of those suppliers in the study area. The total economic impact (summation of the direct, indirect and induced effects) from development spending within a quarter-mile of DART stations amounts to $3,356,360,469 as shown in Table 2. Also from Table 2, the description of employment created by public development spending can be seen. The jobs created by the direct spending total 12,046. Additionally, indirect and induced effects generated 3,206 and 5,490 jobs, respectively. The total number of jobs created as a consequence of development of public properties amounts to 20,741. Moreover, value added, a measure that can be seen as gross regional product, shows how the development of public projects adds to the local economy. Total value added summed to $1,823,597,065 for public projects. The effects of public projects within a quarter-mile radius of DART stations generated a total of $278,141,545 in federal tax revenue and $105,302,562 in state and local taxes. For ease of comparison, the various federal, state and local taxes have been grouped into four categories: employee compensation-related taxes, production-related, household and corporate taxes. State and local and federal details are presented in Table 3. 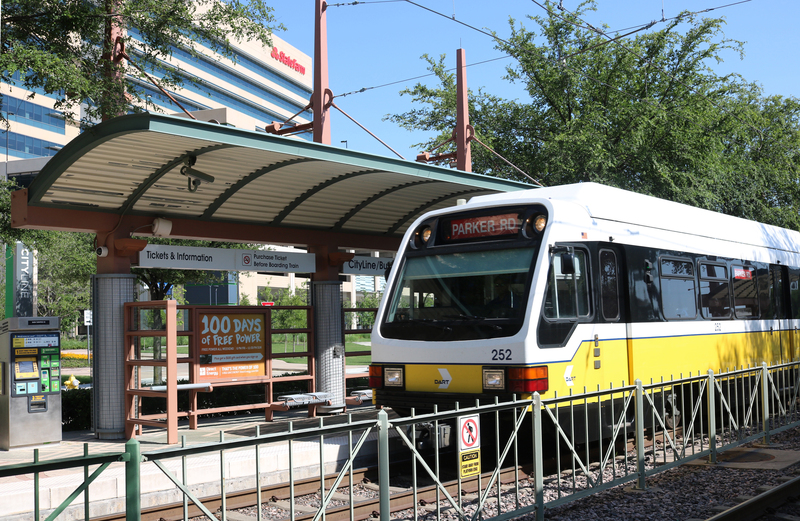 The purpose of this document is to identify and calculate economic impacts of real estate development projects within a quarter-mile radius of DART light-rail stations. The study is a follow-up to the 2013 analysis completed by this office and analyzes development projects in 2014 and 2015. The values of all projects included in the analysis were determined through a combination of steps, including the use of their estimated values as published in the sources analyzed, cross-checking the properties with the Dallas and Collin county appraisal districts where possible, and augmenting all information with a review by analysts at Cushman & Wakefield. IMPLAN software was used to create an economic input-output model to measure the direct, indirect and induced impacts of the development projects on the Dallas-Fort Worth region. Projects “Completed or Under Construction” are responsible for $2.03 billion in total spending throughout the region supporting over 12,000 jobs paying $703 million in salaries, wages and benefits. Projects “Completed or Under Construction” generated $69 million in state and local tax revenue. Potential spending for projects “Planned or Proposed” could result in $5.1 billion of total spending in the region, which would support over 31,000 jobs and pay almost $2 billion. Potential spending for projects “Planned or Proposed” could generate $160 million in state and local tax revenue. 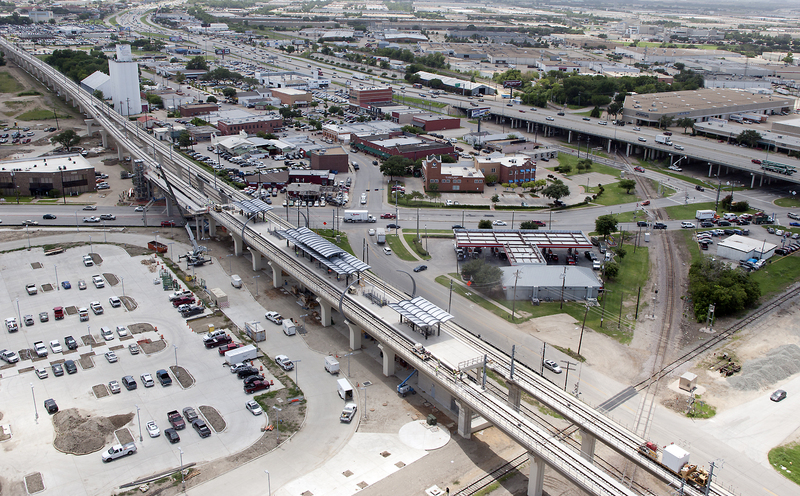 In 2013, our office examined the economic impacts associated with construction near DART rail stations. This study is a follow-up to that analysis and examines the impacts of projects that were proposed, planned, underway or completed near DART stations in 2014 and 2015. As with the previous study, construction activity is only considered if it took place within a quartermile of a DART station. Further, this study does not include downtown stations. While our focus is only on projects within a quarter-mile of a DART station, it is likely that the effects of station proximity spread beyond this impact zone. The underlying data used for the calculation of impacts – the real estate development projects – were gathered through an ongoing review of publicly announced projects in publications such as The Dallas Morning News, Dallas Business Journal and assorted community newspapers and online resources. A total of 27 projects were identified, then organized by type and status of completion. First, details of the projects were examined, which helped assign them to one of four categories: “Non-Residential,” “Multi-Family,” “Single-Family,” and “Health Care.” The next step was to establish their stage of completion. Of the total number of projects, 16 were assessed as “Completed or Under Construction” and 11 as “Planned or Proposed.” Intermittent consultation with a DART representative over the two-year period helped refine what emerged as a database of properties proposed, planned, underway or completed during 2014 and 2015. The values of all projects included in the database were determined through a combination of steps, including the use of their estimated values as published in the sources analyzed, cross-checking the properties with the Dallas and Collin county appraisal districts where possible, and augmenting all information with a review for accuracy by commercial real estate analysts. To understand how the effects of development projects constructed within a quarter-mile of DART stations ripple throughout the economy of the Dallas-Fort Worth region, IMPLAN was used to create economic models based on the spending data provided. To better understand this process, a brief look at how impacts are calculated for the development of a property is helpful. Direct effects are the result of the money initially spent in the region by real estate developers, builders and construction companies for the completion of a project. This includes money spent to pay employee salaries, purchase supplies and maintain other operating expenses. Indirect effects are the result of business-to-business transactions. When suppliers to the companies driving the development (e.g., an accounting firm) purchase services or supplies, they create the indirect effect. When the employees of the real estate developers, builders, construction companies and their suppliers spend their income, this causes the induced effect. If the sum of all the activity from direct, indirect and induced impacts is greater than the combined spending of the developer, this is referred to as the multiplier effect. For more detail concerning how the economic impacts were calculated in this study, please see Appendix A. What follows are descriptions of the economic and fiscal impacts for “Projects: Completed and Under Construction” and “Projects: Planned or Proposed.” It should be noted that the economic impacts for projects not yet in the construction phase are offered as economic scenarios of what may happen if the projects in question come to fruition. It is reasonable to assume that some of the projects planned or proposed may never make it to the construction phase. It is also important to keep in mind that while dollar values are associated with projects as they are announced, once reaching the construction phase projects may be expanded or contracted in scale and material costs may have fluctuated from initial projections. These uncertainties can result in direct spending on a project that is higher or lower than previous expectations. Construction activity within a quarter mile of DART rail stations in 2014 and 2015 resulted in significant economic activity for the Dallas-Fort Worth region. The projects either in the construction phase or completed in this time frame resulted in over $986 million in direct spending and a total economic impact of $2.03 billion for the region. This activity created more than 12,000 construction-related jobs paying almost $69 million in salaries, wages and benefits (Table 1). When the projects are grouped together according to function, further insight is gained concerning the economic effects of differing types of development. Impacts generated by activity in the non-residential sector are the largest out of all the sectors. The non-residential sector includes office buildings, retail stores, hotels, training facilities, mixed-use developments and public projects such as libraries, convention centers and police headquarters. Direct spending of $181 million on non-residential real estate development projects resulted in a total economic impact of $336 million for the Dallas-Fort Worth region. This activity supported just over 2,000 construction-related jobs paying $127 million in salaries, wages and benefits. State and local fiscal impacts amounted to $10.5 million (Table 2). 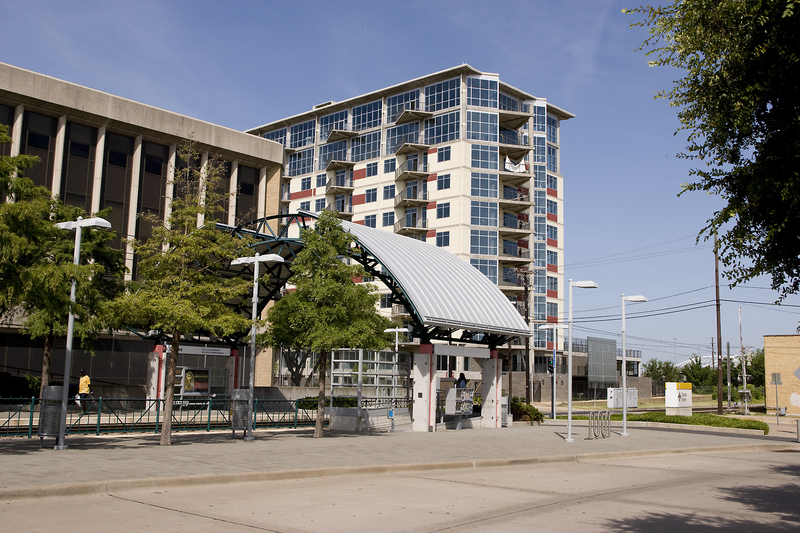 The multi-family residential sector includes apartment complexes and multi-family residential units within a quarter mile radius of DART stations. Multi-family residential projects were directly responsible for $796 million in direct spending, creating significant indirect and induced impacts for a combined total impact of over $1.6 billion. This activity supported almost 10,000 construction-related jobs paying $570 million in salaries, wages and benefits. State and local taxing entities received $58 million as a result of these development projects (Table 3). The single-family residential sector showed the weakest economic impact out of the categories analyzed. A total of $8 million in spending provided a modest $15 million in total economic impacts for the Dallas-Fort Worth region. This activity facilitated 101 constructionrelated jobs paying $5.7 million in wages, salaries and benefits. State and local tax revenues from single-family residential development are also comparably low, with $557,412 reaching city and state coffers (Table 4). As the spending for projects under construction or completed suggests, real estate development has recovered from the 2007-2009 recession in the Dallas-Fort Worth region. In addition, the region is one of the fastest-growing nationwide in terms of population and continues to be the destination for corporate relocations. 6 7 As a result, many real estate development projects were proposed or in the planning stages in 2014 and 2015 that fall within a quarter-mile of DART rail stations. To gain perspective of the magnitude of these projects and their potential impacts on the Dallas-Fort Worth region, the reported details (e.g., square footage, construction value, use classification) of 11 projects were captured from various media outlets, placed into a database, then verified by a third party to ensure accuracy of the media reports. The estimated value of the 11 projects either in the planning stages or proposed in 2014 nd 2015 offers potential for significant economic impact on the Dallas-Fort Worth region. Potential direct spending of $2.7 billion to complete the projects in question would result in potentially $5.1 billion in total economic impact for the region. This activity would create more than 31,000 jobs paying almost $2 billion in salaries, wages and benefits and generate $160 million in state and local tax revenues (Table 5). As with projects that are completed or under construction, when the projects are grouped together according to function, further insight is gained concerning the potential economic effects. Unlike projects that are completed or under construction, projects proposed or already in the planning stages are less varied in scope and fall into the “Non-Residential” and “Multi-Family” categories. The office buildings, mixed-use developments, public projects and more that are proposed or in the planning stages are estimated to provide $2.6 billion in direct spending, which would result in a total economic impact of almost $5 billion for the Dallas-Fort Worth region. This activity would provide for just over 30,000 construction-related jobs paying over $1.8 billion in salaries, wages and benefits. State and local fiscal impacts would amount to close to $154 million (Table 6). If fully realized, the apartment complexes and multi-family residential units planned or proposed within a quarter-mile radius of a DART station may result in $96 million in direct spending and $203 million of total economic impact. This activity would support 1,208 construction-related jobs paying nearly $69 million in salaries, wages and benefits. State and local taxing entities would receive $7 million in revenues if these development projects were completed (Table 7). The Dallas-Fort Worth region’s economy weathered the recessionary period between 2007 and 2009 better than most metropolitan regions in the United States. The substantial development within a quarter-mile of DART stations analyzed in our last report attests to the region’s economic health. The current building boom the region is experiencing is reflected in the number of projects “Completed or Under Construction” while the continued health and growing strength of the region’s economy is portrayed in the billions of dollars of projects currently in the planning stages or being proposed. As this office has done over the past 16 years, the total values of properties near DART stations has been aggregated over the 2014-2015-time period. In Table 8, we add to this the values found in Section II of this report for public projects, as well as Section I values from previous studies. Over the 2014-2015-time period, the total property values, including “Completed or Under Construction” and “Planned or Proposed,” summed to $3.7 billion. When added to the previous totals, total property values near DART stations amount to $10.8 billion (Table 8). The trend to develop properties near light rail stations extends across the nation. Connectivity and multimodal access are increasingly important in a Texas that is rapidly urbanizing – this is especially true in the Dallas-Fort Worth region. The 27 projects completed, under construction, planned or proposed represent not only the region’s commitment to multimodal transportation options and an urban landscape that reflects the importance of those options, but billions of dollars in economic activity and tens of thousands of jobs throughout the region. Past DART economic impact reports are available at DART.org/EconomicDevelopment. To understand how money being spent developing properties within a quarter mile of a DART station ripples through a regional economy, the first step is to define the region in question. This study uses the Dallas-Ft. Worth region for analysis as its economy is strongly integrated. The U.S. Office of Management and Budget's (OMB) definition of the "Dallas-Ft. Worth-Arlington Metropolitan Statistical Area" is used and the counties included in the region include Collin, Dallas, Denton, Ellis, Hood, Hunt, Johnson, Kaufman, Parker, Rockwall, Somervell, Tarrant, and Wise. After deciding on a region for analysis, the values of the selected properties are placed into an Input/Output economic model that examines how the money being spent on property development ripples through a regional economy. Input/Output methodology allows for insight into forward and backward linkages that are present in any regional economy, highlighting how they add value to the initial dollar spent. The model — in this case facilitated by the IMPLAN software package — measures the total annual economic activity that results from inter- and intra-industry transactions. The model first breaks the economy into 536 separate sectors with each sector representing an individual industry, then it uses a sectoring scheme developed by the IMPLAN Group. This scheme is closely related to the Bureau of Economic Analysis (BEA) REIS model and is a 536 X 536 (row x column) matrix showing all the economic activity between the individual sectors. The entries in the matrix are based on the dollar amount that each industry sells to (and purchases from) other industries in a regional economy. It measures the amount of final consumption by the residents of the region as well as how much each industry exports from the area. The model uses data collected at the county level, which are obtained from the IMPLAN Group and the BEA. County data are in turn aggregated or "rolled-up" to form service areas such as local regions, states or larger geographic regions such as the Midwest. Input/Output models are able to estimate economic impacts because the flow of goods and services within an economic region is relatively stable. Predictions can be made of an industry's total economic impact by examining the purchasing patterns of the individual sectors. The BEA collects extensive data on these regional trade flows and reports their findings annually. After the region is selected and the data on spending are entered, how the spending flows through the region and impacts it can be calculated. The three levels of spending impacts analyzed are direct, indirect, and induced. The direct impact includes the purchases of resources (labor, goods, and services) by real estate developers, builders, and construction companies for the completion of a project. The indirect impact occurs through industry-to-industry purchases made by regional suppliers. Finally, the induced impact reflects the change in household demand as the employees of real estate developers, builders, and construction companies and the employees of their suppliers earn dollars for consumer spending. Therefore, the total impact to the economy is the summation of the direct, indirect, and induced components. The indirect and the induced portions are commonly known as the multiplier and their impacts often referred to as the "multiplier effect." It shows how the initial (direct) spending get multiplied through the economy. Calculating the multipliers based on the supplier relationships and employee consumption patterns are much more accurate than simple multiplier tables. The effects that the three levels of impacts and related spending have on employment is also calculated in the IMPLAN economic model. Employment is the total number of full-time wage and salary employees, plus the number of self-employed workers in a particular industry. Part-time workers' hours are aggregated into full-time equivalents (2,080 hours), and reported with the full-time workers. An IMPLAN economic model will draw from multiple sources of data to offer employment estimates. This is due to the differences in how employment data is gathered by varying government agencies. In general, due to nondisclosure rules, the employment figure reported by government agencies often underestimates true employment in a given county. In accordance with U.S. Code Title 13, Section 9, no datum is published that would disclose the operations of an individual employer or put an individual employer at an unfair disadvantage. By carefully combining the employment figures reported by the U.S. Department of Labor, Bureau of Economic Analysis, U.S. Census, and the Internal Revenue Service, a fairly comprehensive employment figure can be reconstructed. The raw data are then "sectored" into the appropriate NAICS and, in turn, combined into the necessary industry vectors and IMPLAN matrices. The result of this process is a "Total Employment" impact figure that is a result of the three levels of economic impacts associated with the initial spending. An IMPLAN economic model also calculates employee compensation which includes all salaries, wages, and benefits paid to the industry's employees resulting from the direct, indirect, and induced employment impacts. The figure includes the proprietors' income of self-employed persons in the industry. The figures reported are gross amounts and taken from the IMPLAN data set. Input/Output methodology and IMPLAN software allow one to leverage and integrate the enormous amount of data collected by government agencies. As such, a reliable model of how spending affects a regional economy can be developed. These models take into account not only how money is initially spent in the "direct" stage of an event, but also inter- and intra-industry transactions. These transactions establish forward and backward linkages in a regional economy during the "indirect" and "induced" stages. In addition to spending, these models also estimate the resulting change in employment. The end product is a comprehensive economic analysis of a given event and its effect on a region. 1 This radius has been shown to be the benchmark when considering the positive impact development has on surrounding areas. Click here to return to the original place in the study that referred to this note. 2 Bollinger, C. & Ihlanfeldt, K. (1997). The impact of rapid rail transit on economic development: The case of Atlanta's MARTA. Journal of Urban Economics, 42, 179-204. Click here to return to the original place in the study that referred to this note. 3 Cervero, R. & Landis, J. (1997). Twenty years of the Bay Area Rapid Transit System: Land Use and Development Impacts. Transportation Research A, 31(4), 309-333. Click here to return to the original place in the study that referred to this note. 4 Weinberger, R. (2000). Commercial Rents and Transportation Improvements: The Case of Santa Clara County's Light Rail. Cambridge, MA. Lincoln Institute for Land Policy. Click here to return to the original place in the study that referred to this note. 5 Seen from the p-value, which tells us the probability of getting a result at least as extreme as the one observed. Click here to return to the original place in the study that referred to this note. 6 Young M. E. (2015, May 20). Population gain in Dallas-Fort Worth is eye-popping, census figures show. The Dallas Morning News. Accessed from http://www.dallasnews.com/news/metro/20150520-some-things-really-are-bigger-in-texas-census-figures-show.ece Click here to return to the original place in the study that referred to this note. 7 Amburgery-Sood, E. (2015, November 13). The fastest-growing ZIP codes in a booming North Texas. Dallas Business Journal. Accessed from http://www.bizjournals.com/dallas/blog/morning_call/2015/11/the-fastest-growing-zip-codes-in-a-boomingnorth.html Click here to return to the original place in the study that referred to this note.